Wild-caught Flounder fillets in a delicious, crispy coating. Three reasons why our Crispy Battered Flounder Fillets are a classic, family-pleasing favorite: flaky, tasty and oh-so tender. And at just 20 minutes from oven to plate, it’s easy to turn any meal time into flounder time. Although great care is take to remove bones, some may remain. UNCOOKED. KEEP FROZEN UNTIL READY TO COOK. FOR FOOD SAFETY AND QUALITY, FOLLOW THESE COOKING DIRECTIONS BELOW. 2. Heat oven to 425ºF. 3. Arrange uncooked fish fillets in a shallow metal baking pan, leaving space between fillets. 4. Bake uncovered 18 to 20 minutes* until coating is golden brown and crispy. Turn fillets over after 10 minutes of cooking. *FULLY COOK FISH TO AN INTERNAL TEMPERATURE OF 165ºF OR HIGHER BEFORE SERVING. 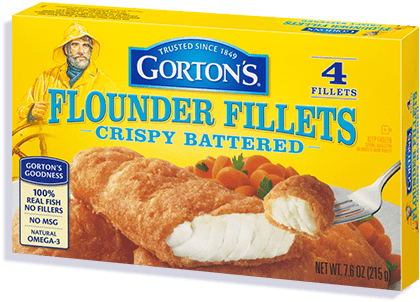 FLOUNDER, ENRICHED BLEACHED WHEAT FLOUR (FLOUR, NIACIN, IRON, THIAMIN MONONITRATE, RIBOFLAVIN, FOLIC ACID), VEGETABLE OIL (COTTONSEED AND/OR CANOLA), WATER, MODIFIED CORN STARCH, LESS THAN 2% OF: BAKING POWDER (BAKING SODA, SODIUM ALUMINUM PHOSPHATE), SUGAR, SALT, PALM OIL, ONION POWDER, YEAST, WHEAT FLOUR, COLORED WITH PAPRIKA AND TURMERIC EXTRACTS, NATURAL FLAVOR, WHEY, DEXTROSE, SODIUM TRIPOLYPHOSPHATE (TO RETAIN FISH MOISTURE), TBHQ (TO PROTECT FLAVOR). Not a significant source of dietary fiber, vitamin A and vitamin C.
150mg of EPA and DHA Omega-3 fatty acids per serving.